Picture this. A new country has got its independence and is immediately catapulted into the throes of war. Having no bombers in its air force, transport aircraft are rigged with bombs and thrown down on the invaders, their effectiveness being questionable. And so the leaders of the new Air Force are forced to induct a bombing capability. Several offers are made, and then someone realizes the junkyard and many bombers lying therein. These were the B-24 Liberators left behind destroyed by their British operators with bulldozers rammed in the fuselage, sand poured in engines, and whatever you can think of, exposed to the horrendous conditions of mother Nature with heat, humidity and the monsoons. Yes, we are talking about Chakeri airfield, Kanpur in the state of Uttar Pradesh, India. Surprised!! 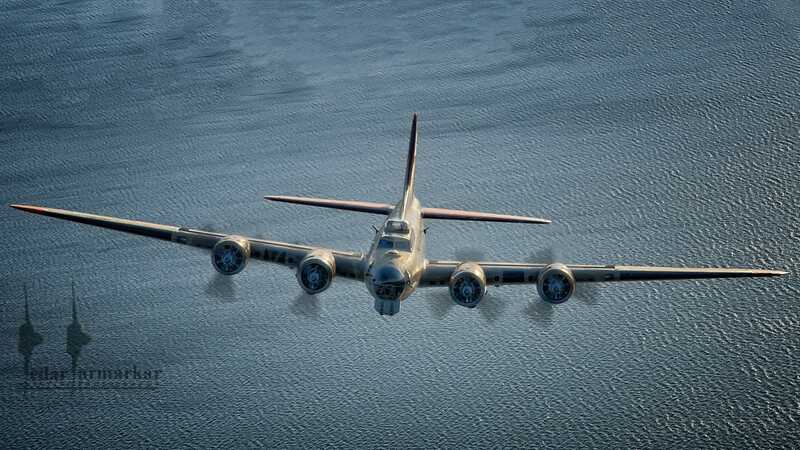 Unfortunately, the WW-II popularity contest in history is always won by the Boeing B-17 Flying Fortress, and P-51 Mustangs, Spitfires and F-4U Corsairs on the fighter front; even so many C-47/DC-3 transport aircraft survive the world over today and are flying actively – Seen below is a Boeing B-17 Flying Fortress flown by the Collings Foundation (Left), and to the right is the Douglas DC-3 Gooney Bird, or Dakota or Skytrain to many. 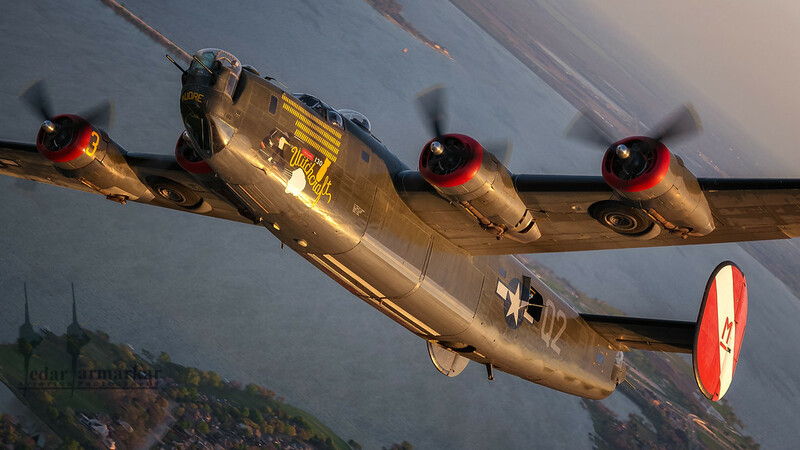 Not many folks realize that the B-24 Liberator was the most produced bomber aircraft in history – the approximate number being between 19,000 and 20,000 examples – evolving to many models with enhancements to suit the type of missions it undertook, serving in many different branches of service, and nations that operated them. The B-24 was used for strategic bombing, radar and electronic warfare platforms and precision guided munitions deployment missions, transports, and was operated by the US Navy and US Marine Corps as PB4Y Privateer, Royal Australian Air Force (RAAF), South African Air Force (SAAF), and in civilian use by Qantas as well. 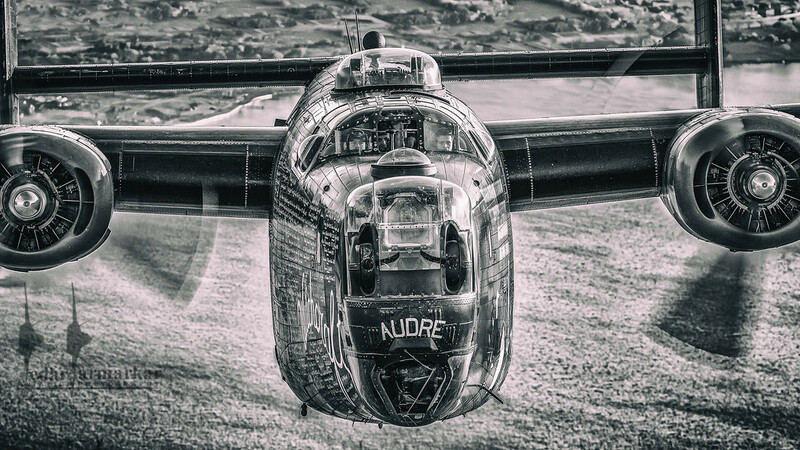 The Royal Air Force (RAF) also used B-24 Liberators extensively in the bombing role, maritime anti-submarine role in Coastal command, pathfinder role, and even jamming ground and night fighter radars while serving with No.223 Squadron, RAF. The RAF used them in almost all the theaters of war: Middle East, Europe, Pacific as well at home. The survivors, in stark contrast are a handful – around a dozen survive as of today as either static display or 2-3 flying examples. 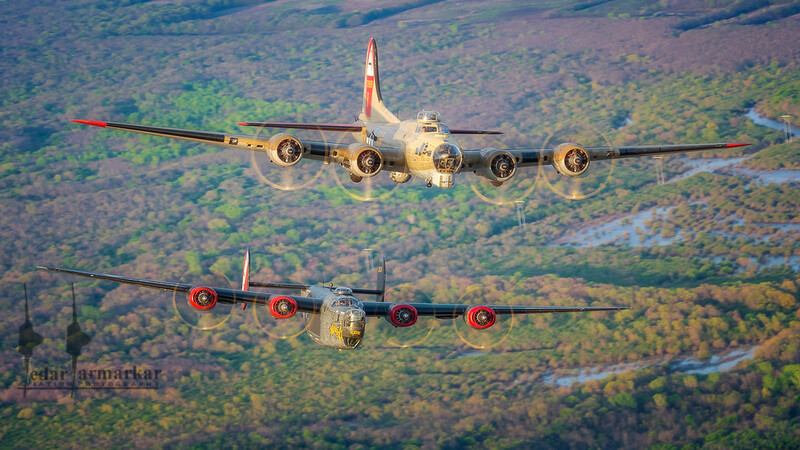 Seen below left, is the B-24 Liberator named “Witchcraft” and is an Ex-Indian Air Force frame and was one of the B-24s that was restored back into service; on the right are both the B-17 and B-24 flying together. 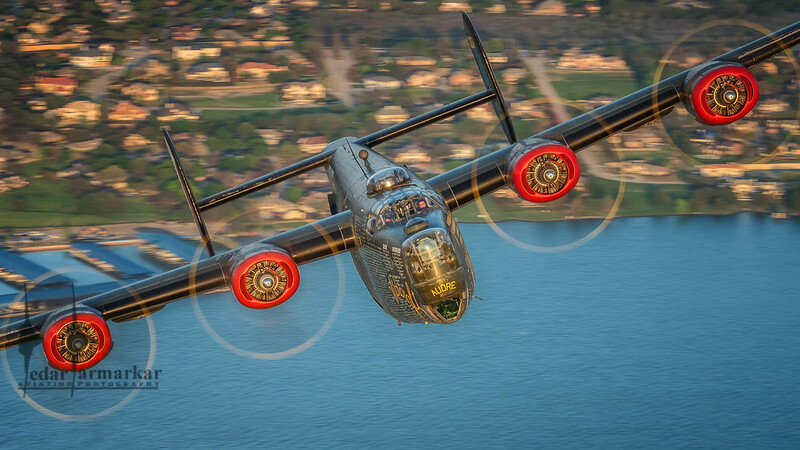 The B-24J Liberator model was powered by four Pratt & Whitney R-1830-65 turbo super-charged radial engines. It could carry 12,000 lbs of bombs with a range of 2,100 miles and could fly as high as 28,000 feet. Its maximum speed was 290mph (250 knots) with a cruise speed of 215 mph (~190 knots). It carried a crew of 11 – splitting the responsibilities of pilot, co-pilot, navigator, bombardier, radio operator, nose turret gunner, top turret gunner, two waist gunners, ball turret gunner, and the tail turret gunner. 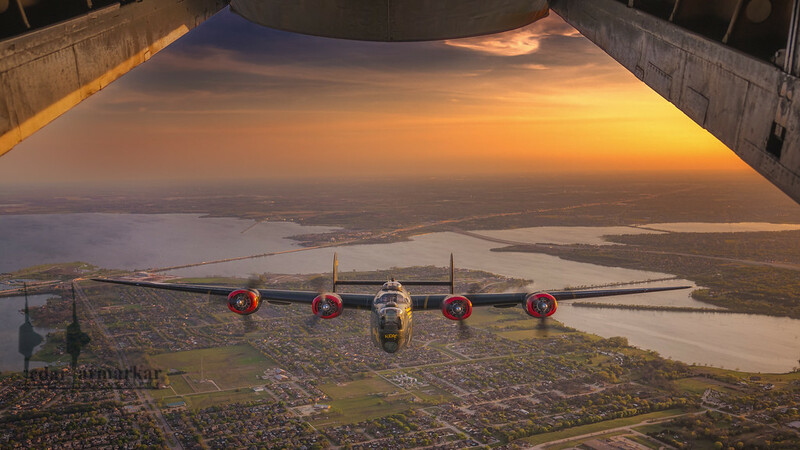 One of the least known facts about the B-24 are their use on classified missions carried out by the Office of Strategic Services (OSS) code named Operation Carpetbagger. Nowadays we hear about special coatings of Radar Absorbent Material (RAM) applied to aircraft in the paint to reduce their signature to enemy radar systems. Well during World War II, radar for detecting enemy aircraft had just begun, and the main threats were powerful searchlights that illuminated aircraft flying in the dark. The anti-aircraft batteries could then zero in on the bomber and destroy it. The B-24D that were specially flown for the operation were painted with glossy black anti-searchlight paint to disrupt enemy searchlights trying to find bombers in the dark. These missions helped General George Patton’s army during 1944 when it consumed its fuel supply and would have been stopped in its tracks, had it not been for the re-supply missions flown by the crew. To the right is an interesting shot of the B-24 using the deHavilland Caribou’s ramp as a frame in a wide-angle shot. Back to the past. The Lend-Lease act forbade the bombers to be operated by anyone else and hence the reason for their state of destruction and decay after the War, after the British left. Hindustan Aircraft Limited (HAL now Hindustan Aeronautics Limited) was the overhauling center for C-47 Dakotas and took the onus of resurrecting the Liberators. Ground transport for the B-24s was ruled out because of their size and they had to be flown on a one-way trip to HAL’s factor in Bangalore – a distance of almost 950 miles. Specific B-24s were identified, patched up from parts from others and made air-worthy. Now the next challenge was who will fly one way to Bangalore. An offer was made to a few American pilots, but they wanted much more. The job fell to the Chief Test Pilot (CTP) of HAL at the time – Jamshed “Jimmy” Munshi. 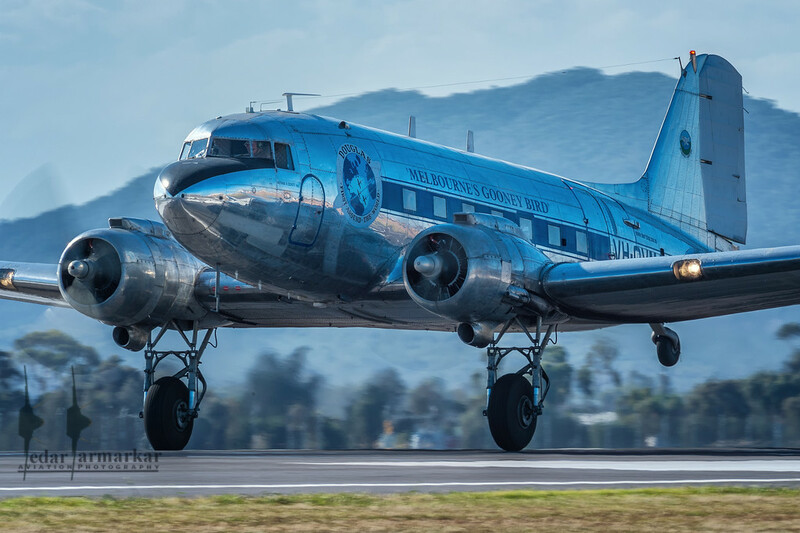 He had flown DC-3s before and had experience with the Pratt and Whitney engines. A manual had to be created scrounging from several of the abandoned air frames. The manual was quickly studied and referenced as the crew got ready to ferry the first Liberator. He opened full power on all engines, listened for anything strange, a quick taxi check for brakes, and off he went to Bangalore with the landing gear extended all the way. Unfortunately there are not many details out there – and I am sure there would be many adventurous stories out there during this operation. Jimmy was able to ferry 42 B-24s patched up from Kanpur and overhauled and returned to air-worthiness by HAL. There was some concern by the Americans who found that the Indians were using B-24s that had been sold and bought illegally. A team was invited to inspect and they returned home happy that all was fine. The IAF had a formidable bomber force in the November of 1948. No.5 Squadron was the first one to receive its full complement followed by No.6 Squadron in 1951. No.16 Squadron was formed as the training and conversion unit for the B-24s later in the same year. Because of the huge contribution of the RAF B-24 Liberators in winning over the U-boat menace during World War II, No.6 Squadron flew maritime reconnaissance carrying sonobuoys and depth charges with the ASV-15 radar featuring a retractable radome in the bomb bay replacing the ball turret that had been originally designed. It also participated in the takeover of the Portuguese colonies in India in 1961 dropping leaflets telling the Portuguese forces to surrender and monitoring sea lanes. The squadron also flew maritime patrols during the 1965 Indo-Pak war. It remained operational until 1968 when the type was retired, making the IAF the last air force on the planet to operate the B-24s. Couple of aircraft were modified and stripped off all external protrusions (replace with turrets etc). These were designated as C-87s and meant for cargo. Since they were lighter and more aerodynamically streamlined they were 20 knots faster and were called Liberator Express at times. These formed the No.102 Survey flights and were called upon to undertake missions like updating old maps and create new charts. One of them was also involved in photographing Mt. Everest and the photos being signed by Sir Edmund Hillary and others. 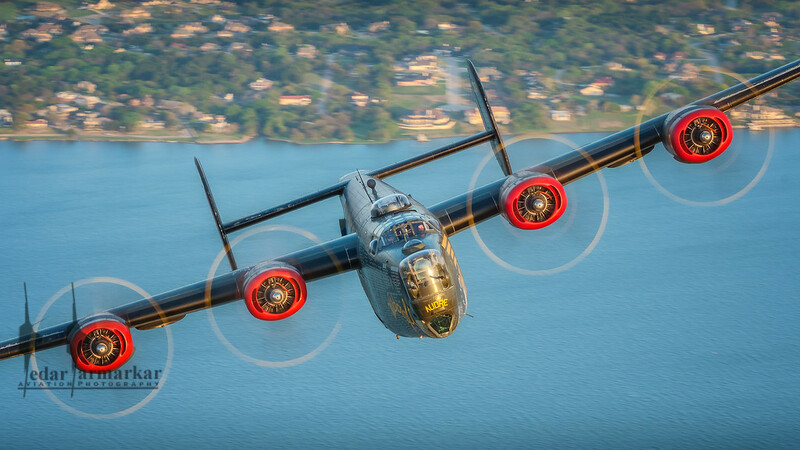 The remaining B-24s were sold for scrap and word got around and many of the museums lined up to get some B-24s while they lasted. 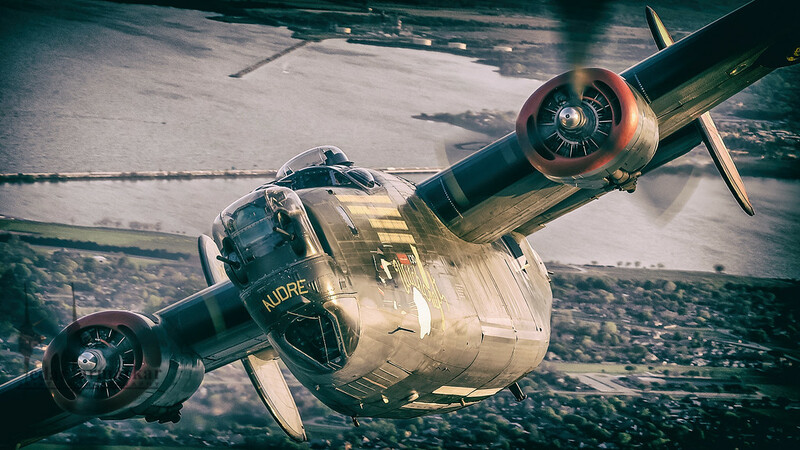 Five of the B-24s returned to life from Kanpur are in museums worldwide. 44-44213 is in the Indian Air Force Museum in Delhi; 44-50206 is in RAF Museum Cosford; 44-44175 is in the Pima Air and Space Museum in Tucson, USA; 44-44272 in Kermit Weeks’ collection in Florida; and 44-50154 in National Aviation Museum in Ottawa. Talking about this particular airframe, S/N#44-44052, it is a B-24J-85-CF. 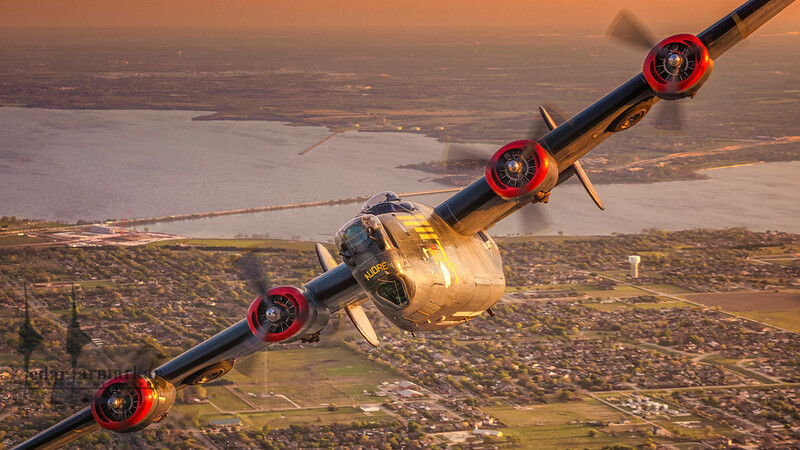 It was built in 1944 at Consolidated Aircraft Company’s Fort Worth plant in Texas. US Army Air Force accepted this October 1944, and this was then transferred to the British Royal Air Force, Air Command South East Asia (ACSEA) with serial number KH191 under the Lend/Lease Act. The aircraft flew anti-shipping patrols, bombing and transport missions on the Indo-Burmese border. It wound up its way at Kanpur in the bomber graveyard on April 11, 1946. This was one of the 42 aircraft that were patched and flown to HAL, Bangalore for service in the Indian Air Force. This particular airframe served as the type for training Engineering officers on the maintenance of the B-24. It was flown to Air Force Technical Training College (AFTC), Jalahalli near Bangalore (or Bengaluru). Unfortunately there are no records that reflect its missions or service in the Indian Air Force, however there is some information out there that mentions this airframe operating as a trainer for the B-24 under the designation T-18 till 1968. In 1981, the British aircraft collector Doug Arnolds (Warbirds of Great Britain Limited) bought this from the Indian Air Force. This was transported to the UK using a Shorts Belfast operated by HeavyLift Airlines. In 1984, Dr. Robert F. Collings purchased the B-24J in an “as is” condition with the intention of restoring it to a static display status. 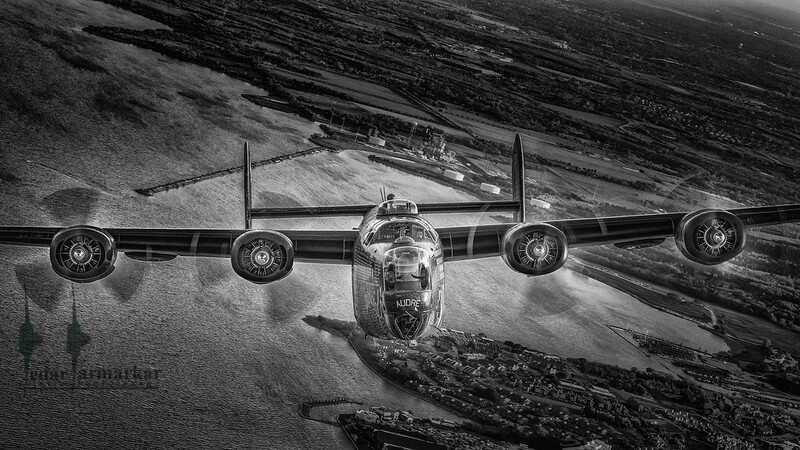 The B-24 reached Stow, MA after a transportation over the sea, and arriving in Boston. An argument was made that convinced Dr. Collings to go in for a full flight restoration rather than just static display. The work was entrusted to Tom Reilly Vintage Aircraft in Kissimmee, FL. 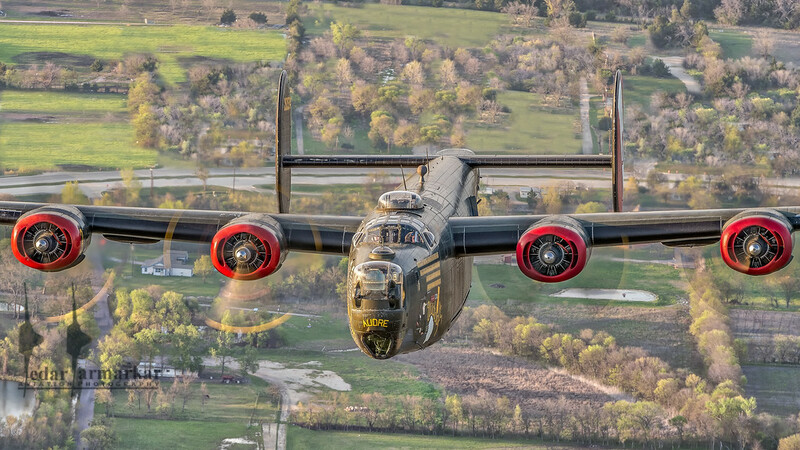 After almost five years of extensive restoration, it flew again in 1989 painted in the original colors of a similar B-24 named Schmitz “Golden Girl/All American” operated by the 15th Air Force, 461st Bomb Group and was lost when flying a mission over former Yugoslavia on October 4, 1944. 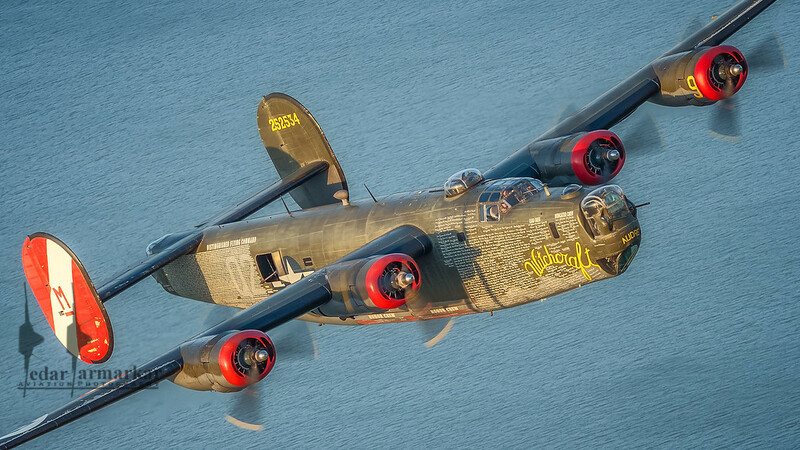 In 1998, it was repainted as “Dragon and its Tail” based on the original B-24 that was flown by 5th Air Force, 43rd Bomb Group in the Pacific Theater of operations. 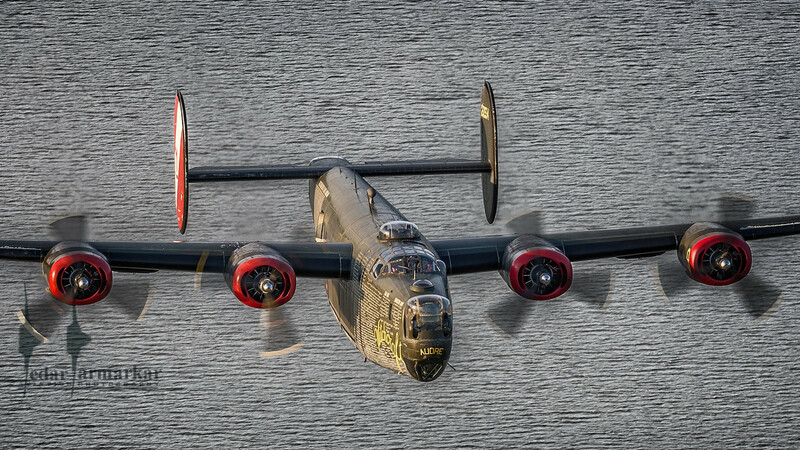 In 2005, it was again repainted as “Witchcraft” after a B-24H that was operated by 8th Air Force, 467th Bombardment Group, 790th Bombardment Squadron of the USAAF. The fuselage adorns the names of the veterans, volunteers and donors. 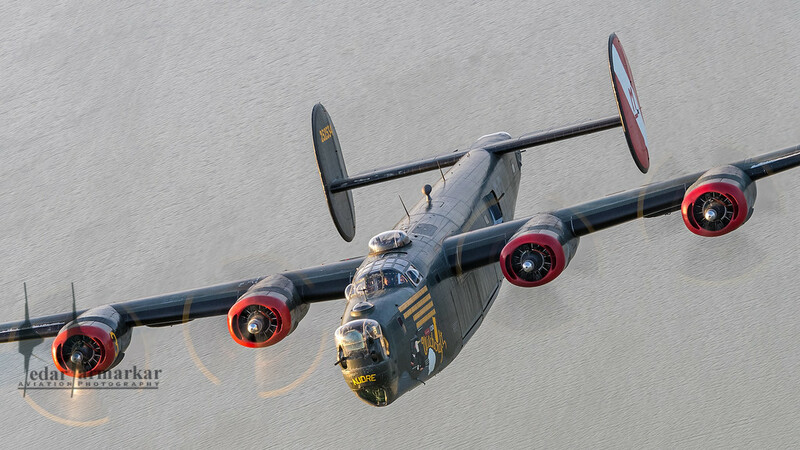 The B-24 now is a part of the Wings of Freedom Tour, visiting over 120 cities nationwide annually with the other aircraft of the Collings Foundation. The Collings Foundation relies solely on contributions and donations to cover the operating costs. A lot of time, and hard work by volunteers goes into ensuring that these relics of World War II are fit and safe to fly. 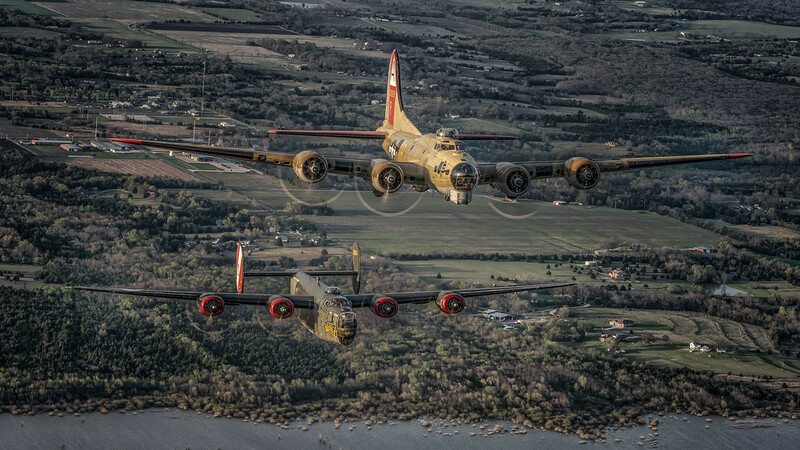 These contributions and efforts by the volunteers and the foundation ensure the future of the aircraft and enables thousands of people both veterans and the new generation to know more about the patriotism, sacrifices of the greatest generation that flew this aircraft creating aviation history. 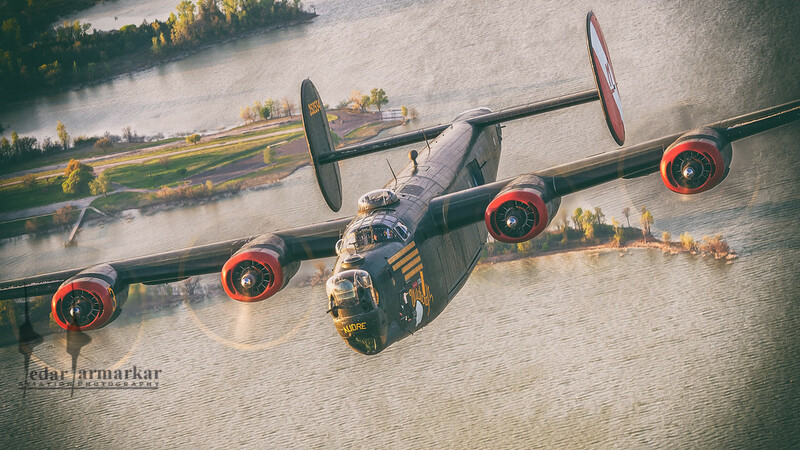 If any of the WW-II buffs remember the B-24, it is the raid on the Ploesti oil refinery in Rumania at the time – that comes to mind. 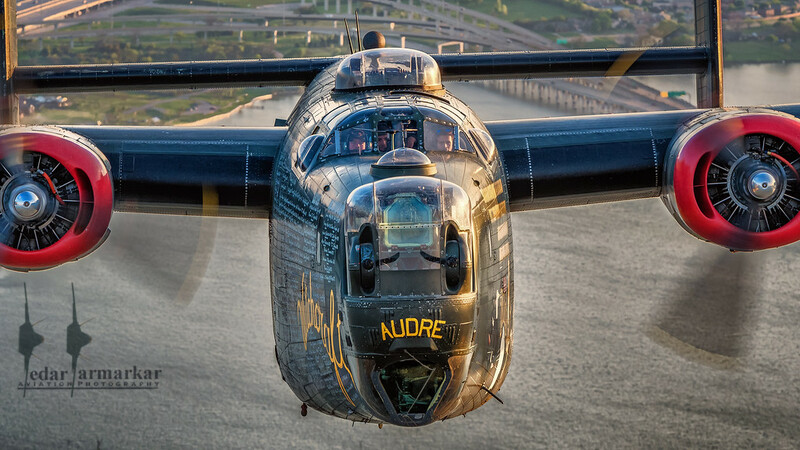 As that raid made the B-24 immortal, the Indian Air Force, along with Hindustan Aircraft Limited resurrected the B-24 back from the dead, and helped preserve the memory of most of the B-24 Liberators that we see today either flying or in museums around the world. My sincere thanks to Scott Slocum, who organized this air-to-air shoot; the volunteers and crews of both the Collings Foundation as well as the Cavanaugh Flight Museum for keeping the bombers and the photoship air-worthy and safe to fly; all my peeps in the Indian Aviation History group on Facebook to provide me pointers to research material on the Interwebs. Till next time, be safe and be well!! !